LAS VEGAS (CES 2018) –The Project Linda Android laptop/phone hybrid from Razer won 20 “Best of CES” show honors, breaking the company’s own records from previous concepts, including Project Valerie (2016), Project Ariana (2016), Project Fiona (2012) and the Razer SwitchBlade (2011). Project Linda is an ultraportable laptop design powered by the Android-based Razer Phone. The docked phone serves as a processing power source and intelligent touchpad, bridging the gap between handheld entertainment and laptop convenience. The Verge awarded Project Linda with “Best of CES,” and similar accolades were received from Mashable, Ars Technica and many other publications. 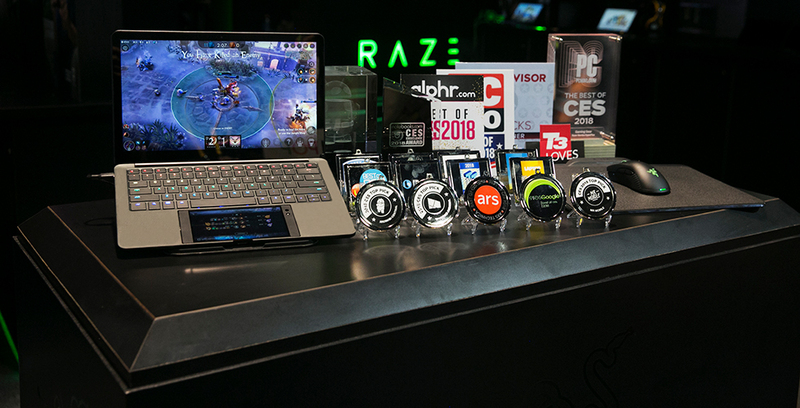 Razer’s past official “Best of CES” honors included “People’s Voice” in 2011 and 2012; “Best of Show,” “Best Gaming” and “People’s Voice” in 2013; “Best PC” and “People’s Choice” in 2014; “Best Gaming” and “People’s Choice” in 2015; “Best PC” and “People’s Choice” in 2016; and “People’s Choice” in 2017. The company is welcoming feedback on Project Linda via Razer’s social channels, including Razer Insider, Facebook and Twitter, for those interested in shaping the future of the Android laptop hybrid concept. In addition to Project Linda, Razer received significant attention for the Razer Mamba HyperFlux, the world’s first battery-less, wireless gaming mouse. The latest addition in Razer’s best-selling wireless line, the Razer Mamba and Firefly HyperFlux, earned five awards as of the date of this release. The Mamba and Firefly HyperFlux combo was awarded PCMag’s “Best Gaming Gear of CES 2018,” Digital Trends’ “Best Mice of CES 2018,” and more.